The township offers six lighted all-purpose tennis courts at the Brundage Park Recreation Complex on Carrell Road in Randolph. The courts are open seven days a week; lights are on until 9:30 p.m. from mid-April to mid-October. 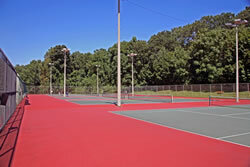 The municipal tennis courts may be used by residents and non-residents who have purchased an annual membership. A tennis membership card must be presented at the courts to play. Memberships for senior citizens are free with a Randolph Senior I.D. Card. Randolph residents receiving public assistance or in the military may also qualify for a free membership. Please contact the recreation office at 973.989.7081 for more information. Randolph residents and non-residents can visit our online registration site to purchase tennis memberships or download and complete our Tennis Membership Application . Membership cards will be mailed to the address you provide.